Astronomers identify exoplanets that would give E.T. a good view of Earth. We see them — but can they see us? Robert Wells, a doctoral student in mathematics and physics at Queens University in Ireland, couldn’t get that question out of his mind. In recent years, astronomers have discovered more than 2,500 planets orbiting other stars by observing the subtle dimming of light as these exoplanets pass in front of their host stars. Wells wondered if alien scientists on some distant world might be doing exactly same thing but in the opposite direction: pointing a telescope our way and noting the flickering of starlight caused by our very own Earth as it “transits” the sun. Wells sifted through astronomical catalogs and identified nine known exoplanets in one of the celestial sweet spots from which an Earth transit would be visible. Alas, it seems unlikely that any of these worlds could be home to alien skywatchers looking our way. Most are Jupiter-sized gas-ball worlds so hot that they’re unlikely to harbor life. But it turns out there’s more to the story. 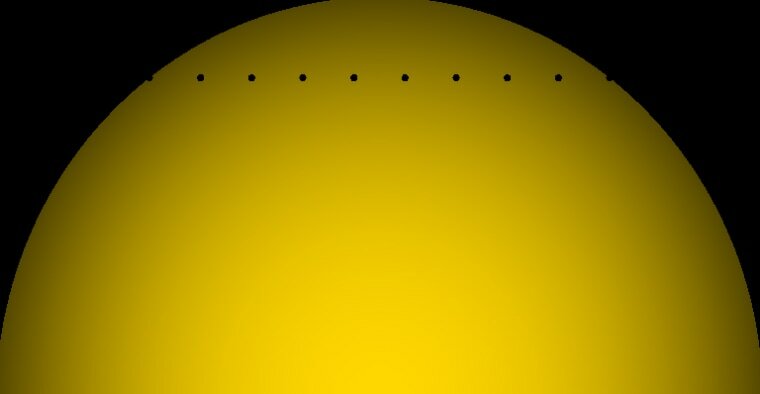 We can observe the transit of a faraway planet only if, by pure chance, it and its host sun are perfectly aligned with Earth — what Wells calls “a very low-probability alignment.” Statistically speaking, however, Wells knew there should be a whole crowd of relatively nearby planets in the sweet-spot regions — hundreds of them, probably — just not angled properly from our point of view. They could see us, but we can’t see them. Even if the planets are aligned almost right, we could be missing out — staring past cozy, Earthlike exoplanets orbiting alongside those hot Jupiter-sized worlds. Unfortunately for any aliens, they face the exact same challenge. An E.T. astronomer might detect Jupiter while overlooking Earth entirely. After crunching the numbers, Wells and his collaborators estimated that, in addition to the nine hot gas-ball worlds (and many more similarly unpromising neighbors), there are 10 potentially habitable worlds located where Earth would be visible to any aliens there using the kinds of telescopes and related equipment that we now use. And experts say there’s no reason to assume that E.T.’s astronomy tools are as primitive as our own. If so, all bets are off about where Earth-spying aliens might be located. They could be watching us from any part of the sky. And depending on the level of their technology, they could know a fair bit about us. Some scientists have speculated that extraterrestrials could detect industrial chemicals in Earth's atmosphere or the glow of artificial lights at night, revealing that our planet has a technological civilization. If the E.T.s are less than 100 light-years away, our radio broadcasts will have had time to reach them. “And if the aliens have really huge optical telescopes, it’s conceivable they might see structures such as the highway systems or cities,” says Seth Shostak of the SETI Institute, which is dedicated to the search for intelligent life beyond Earth. Astronomers here on this planet are working hard to achieve those kinds of capabilities. They’ve proposed building the Habitable Exoplanet Imaging Mission (HabEx) as a successor to the Hubble Space Telescope. With a mirror up to 32 feet across and specialized technology to single out the dim glow of distant planets, HabEx would be capable of detecting Earthlike worlds around nearby stars and scanning them for signs of water, as well as for potential indicators of life like oxygen and methane gas. If approved by early next decade, HabEx could launch by the end of the 2030s. At that point, humans, too, would be liberated from the limitations of transits, capable of finding Earthlike planets all around without relying on the luck of a happy alignment. Even then, though, there’s no guarantee that we’d be able to detect the same aliens who could already be looking at us. Maybe they don’t want to be found. Someday, maybe, extraterrestrials really will make contact. But it may not happen until they like what they see.